It’s been hectic, hence the delay getting this latest e-newsletter out to you. It will no doubt be my last for the year, and what a year it has been! It has been such fun working with some amazing clients and some new partners. Almost too many opportunities to pursue! 2016 will present some different challenges, but I need to get through 2015 first. This e-newsletter is a bit shorter than others, but that means you should be able to get to the end of it more easily, right? 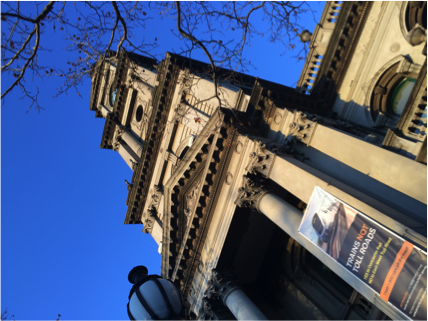 The gorgeous Collingwood Town Hall, one of the locations where Advisory Groups contributed to Liveable Yarra. Latest blog – in full. You may recall from the British series ‘Yes, Minister’, Sir Humphrey would use the term ‘couragous’ as code for ‘politically stupid’ – usually having the effect of dissuading the Minister to follow his stated intentions. It provided great comedy as well as demonstrating a powerful technique to influence someone who is risk averse. However, I think it’s time to reclaim the term couragous. We need it in bucket-loads. Without it, it might be impossible to build trust when we need it most. Sharon and her Board could have chosen a much less couragous path. Faced with a major financial challenge, imposed upon the Board, she could have been forgiven for taking an easier path. She could have resigned in protest. Or she could have easily mobilised their community to protest and complain. Instead Sharon, along with her Board, decided on a more couragous and ultimately wiser path. She was able to articulate what the Board did have control over. At times Sharon even challenged some rather angry community members to think through the likely consequences of taking any other approach. I reflected on other processes I have facilitated over the past 25 years or so. How easy it is for leaders to resort to their default position when a new or novel approach is taken. How many times have I heard from them, ‘Well if they are going to behave like this we won’t bother evening talking to them in future’? Sadly, many leaders have never witnessed what it is like for the community to step up. Usually this is a result of lazy process and a poor remit or question. Regardless, it was what many leaders witness, and what they dread. 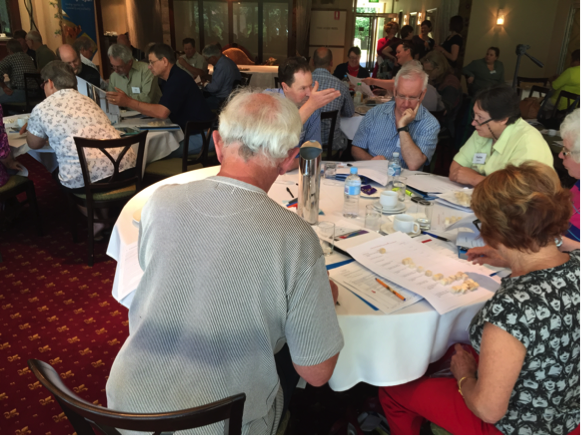 Day 3 of the Deliberative Panel in Mount Barker, South Australia - a mini participatory budgeting process activity. It was great fun to participate in this very dubious debate in Melbourne. Somehow I ended up on the team arguing that deliberative democratic processes are just a fad. Somehow we won! I was thrilled to co-design (with Amanda Newbery and Joel Levin) and participate in a ‘court case’ about the IAP2 Spectrum at the Perth Conference in October. It generated plenty of interest, with an ultimate verdict being ‘The Spectrum needs to be rehabilitated’. Amidst the theatre there was some terrific discussion and many constructive suggestions. A memorable event and a wise jury finding – sentencing the IAP2 Spectrum to rehabilitation! Afterwards, several asked me what my real view about the IAP2 Spectrum was. I told them to read this. • International Project of the Year. Saying just a few words when we won the really big one! 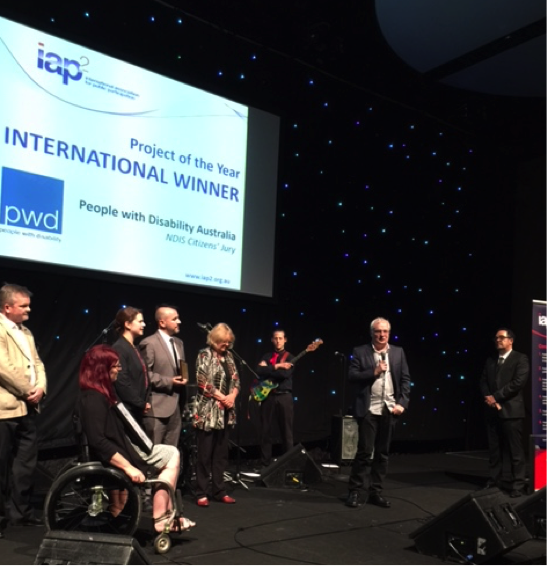 Congratulations to all concerned; especially Alex Madsen (NDIA), Craig Wallace (Chair of People with Disability Australia, PWDA), Mathew Bowden (co CEO of PWDA), Sonya Price-Kelly (PWDA), Danielle Annells, (collaboration whisperer), and of course the jurors and evidence givers. To check out what went on behind scenes check this short film, brilliantly produced by Lara Damiani. The Deliberative Panel for the City of Yarra, to recommend directions for Council to re-write their planning scheme in response to the challenges of rapid urban consolidation. It was a very satisfying process. Loved working with Andrew Howard and Elly Gardner of Capire, as well as the very capable City of Yarra officers. Yet more proof of the ability of citizens to step up, appreciative complex challenges, and to offer wise recommendations. After a number of workshops and focus groups, meetings with advisory groups, and four deliberative sessions, culminated in a report presented to Council. It was unanimously accepted by Council in mid November. Developing community engagement resources and strategy for the Metro Waste Resource and Recovery Group with the wonderful Amanda Newbery of Articulous. Supporting residential development with a real difference, working with Micaela Drieberg, 3 Hills Consulting, and Jason Twill, Lend Lease. Supporting an organisation to innovate and reinvent their focus, structure and engagement strategy. I am also thoroughly enjoying building collegial working relationships with Adam Beck (Centre for Urban Innovation), Nation Partners, Articulous, Village Well, Nick Fleming of Innergise, Cube Group and others that I may have forgotten at this late hour! Why is it called Slime Mould? Check this blog. I have hosted more sessions with Peer Academy and soon to facilitate another on ‘The Art of Asking Powerful Questions’. Shadow consulting – Working behind the scenes for other consulting groups is on the increase. Really enjoying this as well! Last Max Factor e-newsletter I promised to give more information about a unique dining concierge service, FinerDiners. Of course I am totally biased because my Angela Hardy is introducing this in Melbourne, supported by Bruce Joy and myself. To find out more go to www.finerdiners.com.au - we have lots to do on the website but you will get the idea! See you or at least talk to you again in 2016!